Join the millions of people who use Capterra every month. To start your search today, visit Capterra.com/twist. Start building your website today at squarespace.com. Enter offer code “TWIST” at checkout to get 10% off. 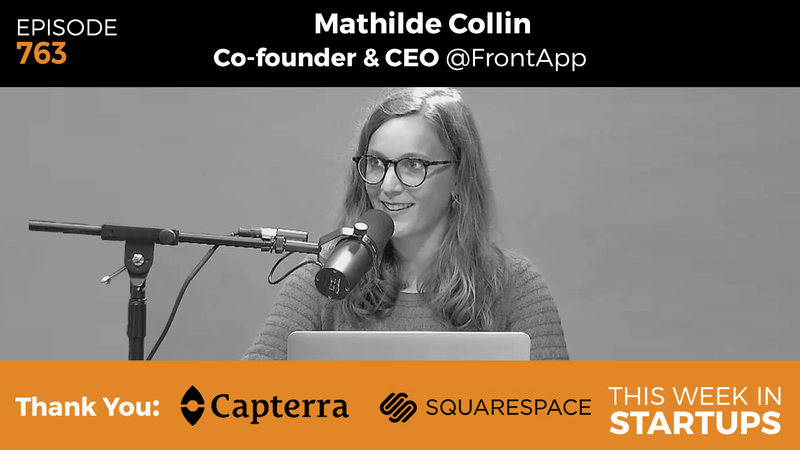 Today’s guest features CEO of Front, Mathilde Collin. Originally based in France, she moved her company of 17 people to Silicon Valley and now has thousands of customers for her enterprise product, which is currently used by Tesla, Cisco, Dropbox, and our very own Inside.com. She went to Y Combinator and has raised $10m+ from some of the most famous investors in the industry, including Dave Morin of Slow Ventures, Alexis Ohanian of Reddit, and Stewart Butterfield of Slack. She is in the studio to talk about her product, Front, which is a collaborative inbox for businesses. Front is like a beautiful LEGO box with every possible feature you need to improve your email workflow. Join us as Jason and Mathilde explore how Front streamlines communication, the competitive landscape with Slack and Zendesk, the impact of machine learning and AI on customer support, work culture in France vs. Silicon Valley, and more. Plus, find out Mathilde’s secret to keeping her team happy. 09:42: Process of relocating 17 employees from France to U.S.
41:32: Work culture in France vs. U.S.